According to the Environmental Protection Agency, about half of all produce in America ends up in the landfill. And that’s the most commercially viable part of the fruits and vegetables, and doesn’t include the greens from say, beet tops. 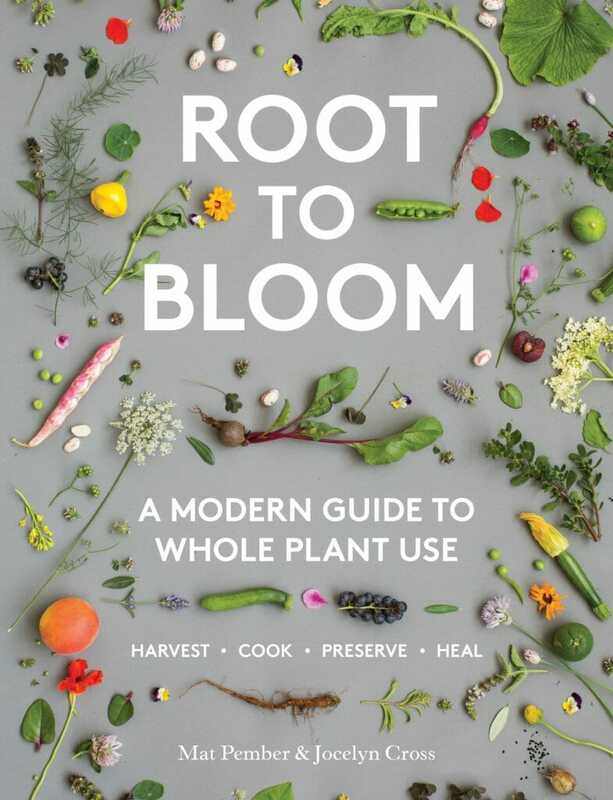 Root to Bloom: A Modern Guide to Whole Plant Use (Hardie Grant Books; $29.99) by Mat Pember and Jocelyn Cross, explores using some of the less familiar bits of plants, mainly for eating but also for herbal medicines, pest control and even dyes. Each plant entry includes a rundown of its history and traditional uses, along with nutritional value, favorite varieties, growing notes and then a recipe or two. It covers things you’d buy in the produce aisle, those more likely found at the farmer’s market, and even plants you forage for. While the book was originally published in Australia, most of the information is applicable for North Americans (just remember, rocket = arugula). I dipped in with a recipe for carrot frond chimichurri, a twist on the South American herb sauce that’s usually made with parsley and oregano. Here, finely chopped carrot fronds (the carrot greens) replace the herbs, and are mixed with garlic, shallots, chili flakes, olive oil, white wine vinegar and lime juice, before sitting to meld together. Chimichurri is often served with a slab of steak, but I doubled-down on the “root to bloom” theme and served mine with roasted carrots, chickpeas and halloumi cheese. The bright carrot tops worked perfectly well in place of parsley. The average supermarket shopper won’t get a lot out of this book. But if you have a farm, a backyard veggie patch or even just frequent the farmer’s market, you’ll find a lot of interesting ideas for making the most of your haul, and even those weeds you’re trying to keep at bay. Excerpted from Root to Bloom by Mat Pember. Recipes Copyright © 2019. Excerpted by permission of Hardie Grant Books. All rights reserved. Chimichurri is a South American uncooked green (verde) or red (rojo) sauce, and is as popular a condiment there as tomato sauce is here. Coriander and parsley usually make up the bulk of the ingredients, but here we have substituted the herbs with carrot fronds, which give the sauce an earthier, more subtle green edge. Combine all the ingredients in a small bowl and season to taste. 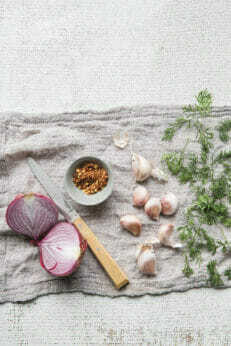 Leave to rest for 30 minutes to 1 hour to allow the flavours to develop. Serve over grilled meat or fish. This is one very grown-up drink. It is one for the men and women of the old country and, if you grew up in Italy, this drink will definitely take you back to your childhood. Otherwise, it will make you behave like a child, so there are no losers here. The grappa’s intense aniseed flavor from the steeped fennel flowers makes it a seriously good mixer with ice, fresh lime and soda water or prosecco. Choose the freshest flowers for maximum flavor to make your grappa. Wash and dry the flowers, then spread them out on a wire rack and leave to dry for 2 days in a cool, well-ventilated area. 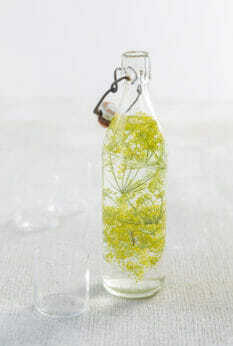 Once dry, pack the dried flowers into a large sterilized glass jar or bottle (see page 14) with an airtight lid. Pour over grappa and leave to macerate for 8 days. To finish, line a fine-mesh sieve with a piece of muslin (cheesecloth) and strain the grappa. Store in a sterilized glass jar or bottle in the refrigerator and drink cold.